... with its cooler mornings and evenings. Of all the seasons I think I like autumn the best. Its been ages since I posted and I was thinking that I had done nothing much but on reflection it is not true. I have still been drawing. I finished the journalling workshop and I have managed to get a bit of canvas work done. 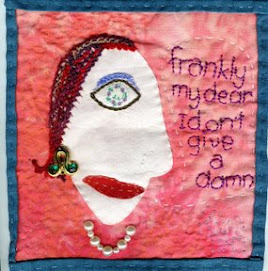 I have also been playing with ideas for a quilt for Filament's exhibition later in the year and an embroidery challenge. I am rather pleased with it -as a novice I find drapery a real challenge and my eye is not so good. This drawing was done starting with some rough outlines in pencil and ten I moved onto pastels. I learnt quite a bit doing this including what the texts books referred to as "muddying" colour when it is over applied. I was trying to make the bottom area dark and kept putting more and more brown on the area. I ended up with an area that has a very flat dull look to it - and to my eye it tens to come forward rather than recede. I will work it again and see if I can improve on it.